Those of you who have been following my work for a while may recall a good few years back now I was rather enthusiastic about a game called Magical Diary: Horse Hall. This unusual game, developed by Hanako Games and Spiky Caterpillar, blended elements of visual novel, life sim and first-person dungeon crawler to create something very interesting indeed — and something that was clearly intended to be the start of a series. That was back in 2012. 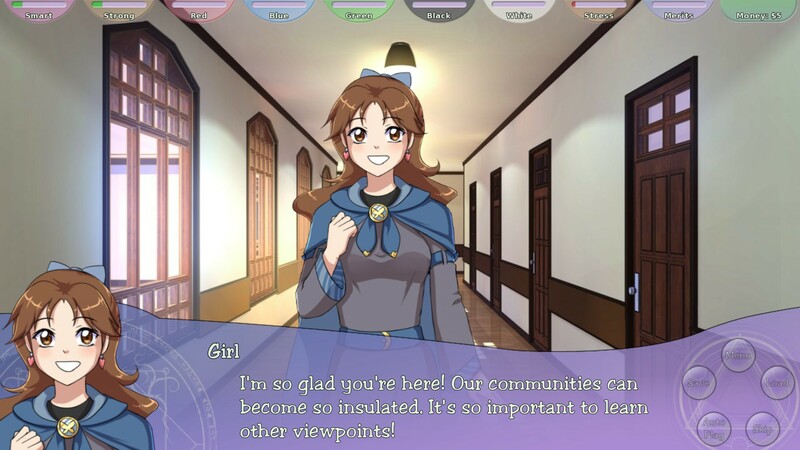 Now, in 2019, we’re finally getting a follow-up — so let’s take a first look at what the sequel, Magical Diary: Wolf Hall, has to offer, and how Hanako Games and Spiky Caterpillar will be making use of crowdfunding to realise their goals. 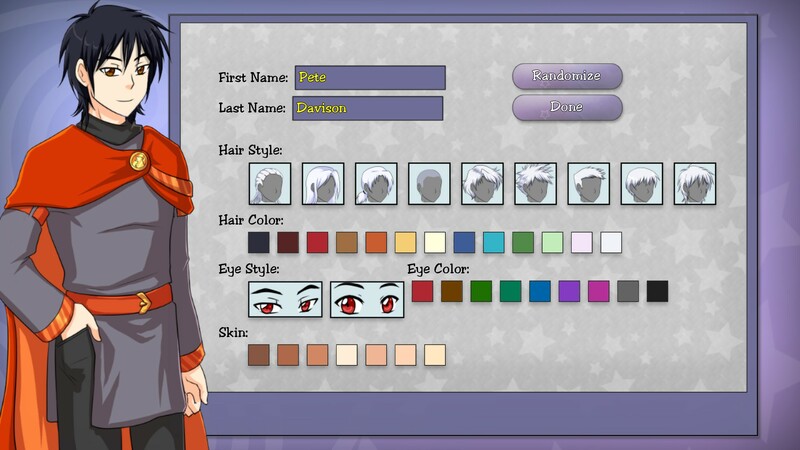 Horse Hall cast you in the role of a female player-protagonist (default name Mary Sue, because obviously) who was coming to wizarding school Iris Academy for the first time, not sure what to make of the whole situation after discovering her latent talents somewhat by chance. 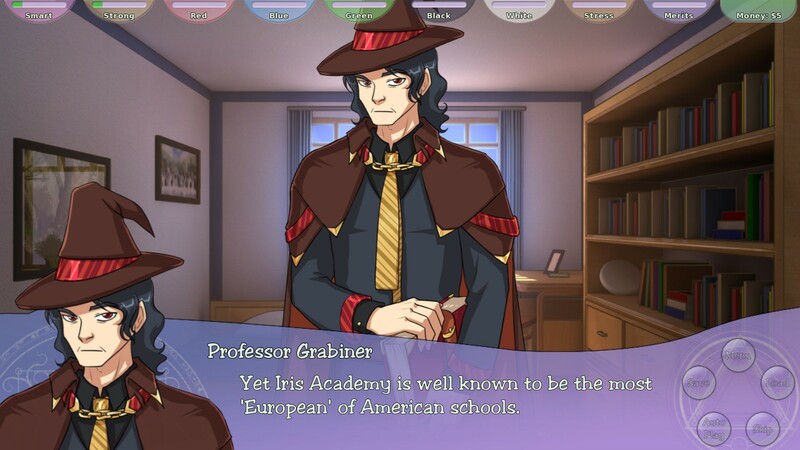 Wolf Hall all but inverts this setup by placing you in the role of a male protagonist (Gary Stu by default — revealed in short order to be an assumed name) from a privileged, established wizarding family, who has come to Iris Academy in an attempt to live life as a “normal” teenager for once. Well, as normal a life as a magically gifted teenager can expect to live, anyway. 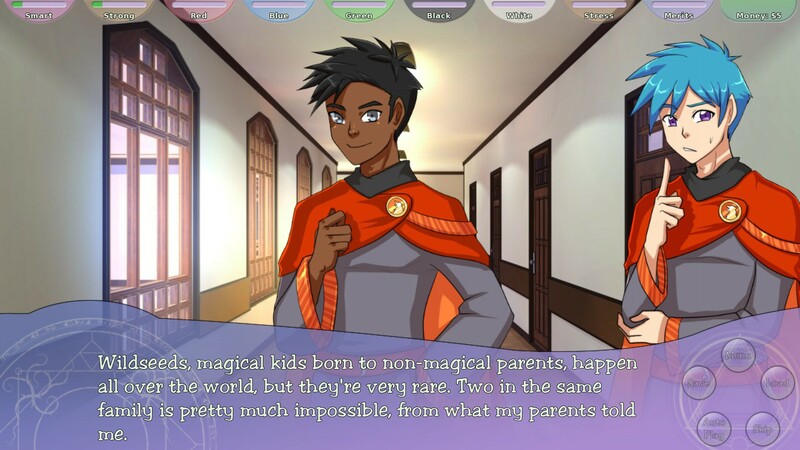 There’s immediate intrigue here; the setup for the story in the game’s current early demo at the time of writing shows that the protagonist clearly has some secrets about his family that he’d rather keep under wraps. It almost seems like he’s specifically trying to get away from more than just a life of privilege, but it remains to be seen exactly what skeletons he and/or his family have in their respective closets. Despite all this, it seems he can’t quite escape his privilege anyway; upon arriving at Iris Academy, he finds that he’s been given a certain amount of special treatment, being met in person by one of the faculty and assigned a dormitory room by himself rather than having to share with a roommate. After the initial introductory sequence, in which our hero meets a number of people who will clearly become major players in the overall narrative, the game proper begins. 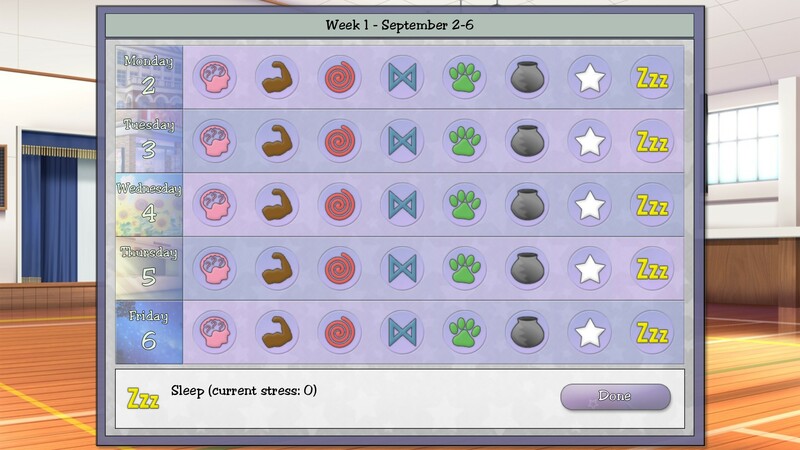 In execution, the basic structure is somewhat similar to Horse Hall: you plan your schedule for the weekdays of the coming week, and the choices you make determine whether you gain experience in any of the five schools of magic (and learn any spells in the process), how much stress and fatigue you build up, and what, exactly, happens during your time on campus. Various events will also have an impact on your character’s “Smart” and “Strong” levels. 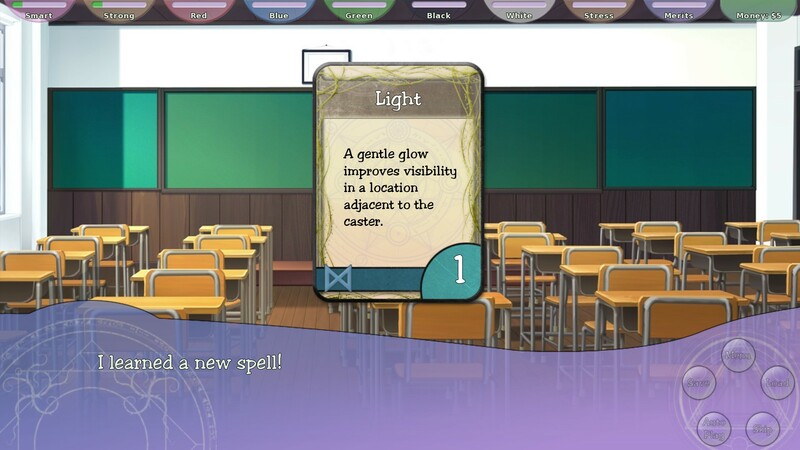 The world of Magical Diary revolves around the idea of pentachromatic magic. There are five distinct colours of magic, each having its own specialism. Red magic concerns the manipulation of energy, Blue the alteration of matter, Green the power of life, White the power of spirit and Black the ability to enchant objects. Some wizards choose to specialise in a particular school; others prefer a more general approach. You are free to choose the way in which you study magic throughout Wolf Hall just as in Horse Hall; the classes you take and the experience you build up will determine which specific spells you add to your spellbook. 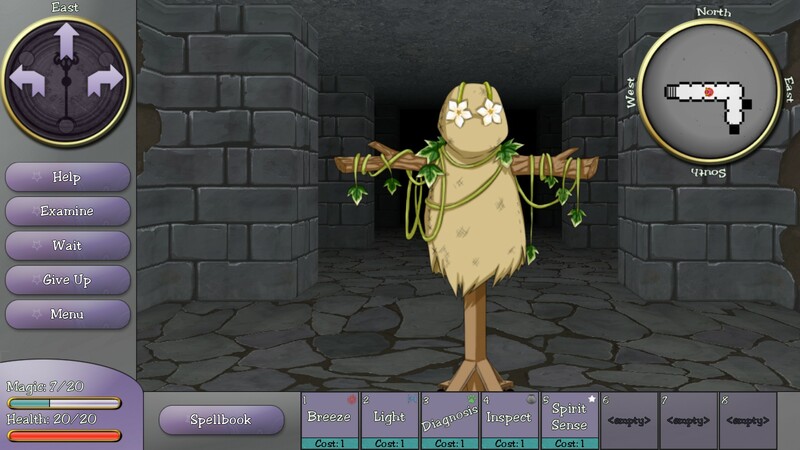 The spells are mostly used during the “dungeon crawling” aspect of the game, which you can engage in freely during in-game weekends as practice, or at predefined moments in the story when you are given an “exam”. The latter case presents you with a dungeon that is either pre-designed or randomly generated according to the specific challenge you’re taking on, and much like its predecessor mostly revolves around puzzle-solving rather than combat. You’ll need to make creative use of the spells you have available to you in order to overcome the challenges ahead of you — and the very different ways in which the colours of magic work mean that there are generally multiple ways to pass any obstacles that might be in your way! The current demo only features a brief “practice” dungeon-crawling sequence in which you can’t really do very much — particularly if you follow the characters’ advice and try a little of every colour rather than throwing all your focus in a single direction — but it gives you an idea of what might be possible. The action is turn-based, so you don’t need to worry about responding quickly to potentially dangerous situations, and clear text boxes explain the effect — or lack thereof — your skills have had on yourself, the environment and any objects or enemies nearby. Although there’s most likely going to be set solutions for particular puzzles in the game, there’s a strong sense of “freedom” during these sequences. When casting a spell, you’re able to not only aim it at an object in front of you, for example, but also the walls and floor of the dungeon, or yourself. The game’s Kickstarter page cites an example of a Black magic specialist knocking down walls in their way, while a Blue magic specialist might teleport themselves to a more advantageous situation — such as the other side of a pit. The challenge ahead of Hanako Games and Spiky Caterpillar is much like one a tabletop dungeon master might face: how to plan for all the possible combinations of abilities the player character might bring to the table in any given situation, and how to ensure the game is “fair” for everyone — in this instance, making sure the player isn’t forced into an unwinnable situation! One way around this is the fact that “failing” one of these dungeons doesn’t mean the end of your game. Rather, it simply means that you’re teleported to safety and given a detention. There are instances where this occurring can even lead to unique narrative threads that you might not be able to see otherwise, so going for a “perfect” playthrough won’t necessarily always be the most desirable option. However, you can’t just flunk out of all of the dungeons; much as in the previous game, accumulating too many demerits will mean the end of your studies! Much as in reality, the most “interesting” experience will doubtless be had through a combination of positive and negative happenings — something Horse Hall was very good at indeed. 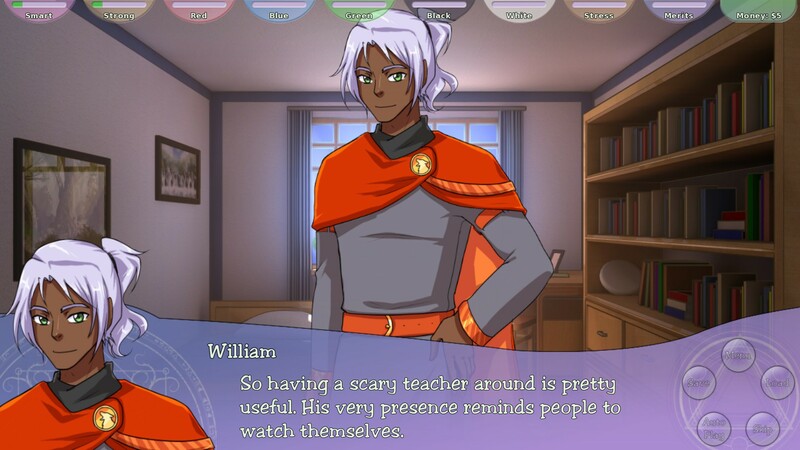 Romance is an aspect of Wolf Hall, but interestingly for this kind of game, it’s completely optional; there’s no obligation to follow a character’s “route” if you don’t want to, and the plan is to incorporate the option to be “just friends” but still follow a character’s narrative if you’re interested in them but don’t want to date them. At the time of writing, there are three dateable women and two dateable men. One of the latter is incubus Damien from Horse Hall; let’s just say he is the very embodiment of the “interesting” experiences I just talked about, so watch out for that one, and expect the unexpected. Probably several times. Wolf Hall looks like being an ambitious game with a lot of possible branches, twists and turns down which the narrative might proceed according to your actions. If it’s anything like Horse Hall, it will be very replayable — both to see different narrative routes and to find different ways to solve the puzzles in the dungeons. The overall presentation has had a bit of a face-lift from Horse Hall. While still adopting a somewhat anime-style aesthetic, the overall quality of the art is higher, with pleasingly smooth lines and nice use of colour. The action now unfolds over the full screen now, rather than the backdrops being confined to a small window; character stats now elegantly move out of the way at the top of the screen when not immediately relevant. The character design is diverse and interesting, and crucially for this sort of thing never feels like it’s pandering to a particular demographic group or just including a certain type of character to check a “diversity box”. These characters are people who just happen to come from a variety of backgrounds; the study of magic is what has brought them all together and, much like in reality, there are certain aspects of one’s identity that either don’t come up at all in conversation, or only once you’re thoroughly intimate with someone. Certainly a far cry from a few cack-handed recent efforts in this regard from the last few years I could name, for sure! There’s also clearly been a lot of effort put in to the overall setting and lore. 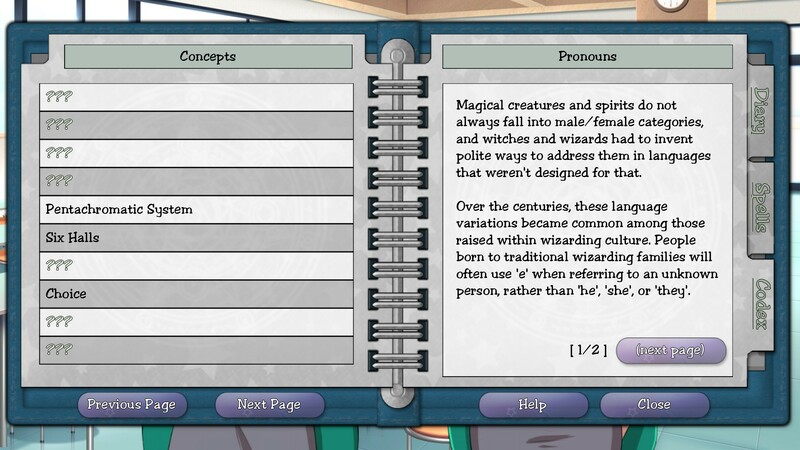 The game incorporates a hyperlinked “Codex” system similar to the “Tips” function found in a lot of modern visual novels; clicking on specialist terminology that is underlined in dialogue allows you to read up on it and find out all about everything from the basics of pentachromatic magic to what pronouns wizards use when addressing magical beings for whom gender is irrelevant or non-existent. In short, it’s all looking very promising, and I’m looking forward to seeing the end result — particularly with how much I enjoyed Horse Hall all those years ago! If you’re not quite that flush but still want to chip in a decent amount, the £76 tier includes not only Wolf Hall when it’s finished (currently estimated for December of this year) but also all of Hanako Games’ previous nine releases on Steam, including Horse Hall, Science Girls!, Black Closet, Long Live the Queen, Sword Daughter, A Little Lily Princess, Date Warp, The Confines of the Crown and England Exchange. I can’t speak for all of these, I’m afraid, but Long Live the Queen is certainly a very good time indeed (although I hope you like death), and I know Black Closet was rather well received too, so this is a good bundle option for those who like the way Hanako Games does things! If you just want a copy of the game itself when it’s all finished, meanwhile, you can get in on that for £15 — an eminently reasonable price for the amount of entertainment the final product will offer. And if you want an early taste, the demo is available right now on both Steam and itch.io. Check out the Kickstarter page here if you want to find out more!